Doesn’t the title of this post sound like some operatic tale? It’s just my way to introduce two different ingredients I’ve been meaning to try for awhile and recently got around to cooking with them. 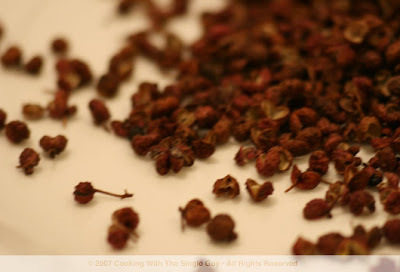 First, I’ve been fascinated by Sichuan peppercorns since I read about them in the great China Moon Café Cookbook. The China Moon Café was a fantastic Asian-fusion restaurant on Post Street in the 1980-90s. I remember having a great meal at the counter as I watched mostly non-Asian chefs creating explosive fires from their hot woks. The cookbook is a very traditional approach to Chinese cooking, and gives very explicit details of cooking from scratch. Chef Barbara Tropp talked about the fragrance of Sichuan peppercorns and I wanted to use them ever since. Of course, I searched and searched and couldn’t find them. That’s probably because for a few years after I read about Sichuan peppercorns, they were banned by the USDA because it could contain citrus canker, which attacks citrus trees. But now they’re legal (they have to be heat-treated) and I’ve seen them popping up at all the gourmet stores. I bought a container of these beautiful rust-colored peppercorns from Whole Foods. Sichuan peppercorns aren’t really from the pepper family but are the dried berries of a prickly ash tree. I know, sounds like some myth created to make them sound more exotic. But the berries do look a bit prickly, don’t they? With my Sichuan peppercorn in my pantry, I decided to make a traditional steamed chicken using salt and grounded Sichuan peppercorn to season the chicken before hand. For fun, I decided to cook with a fresh poussin. Poussin, or spring chicken, seems to be a favorite in some menus lately. It’s basically a Cornish game hen, which I used to always buy frozen and made a perfect dinner for the Single Guy Chef for obvious reasons. This time I bought a fresh poussin at Bristol Farms Market at the Westfield San Francisco Centre. 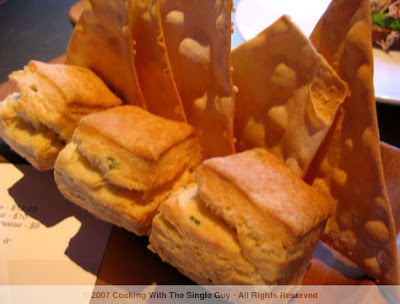 The recipe below is a slight adaptation of a recipe by Tropp, but with fewer steps and smaller serving size for singles. I created a ginger-onion oil that I poured over the poussin afterwards, reminiscent of a chicken dish that’s popular in Hawaii whose Chinese name basically translates to mean “onion-oil chicken.” It’s served cool, but this version is served warm. Enjoy! When ready to cook, remove the chicken from the refrigerator and allow to get to room temperature. Chop your chicken in half down the spine, getting rid of the backbone. 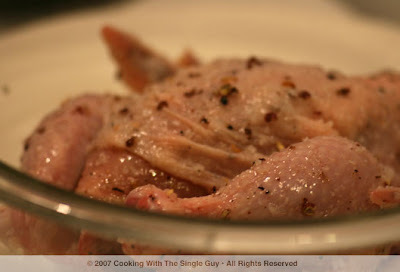 Place the chicken halves flat on a steaming dish and then place in steamer. Cook for about 15-20 minutes until clear liquid drips from thigh bone when pierced. 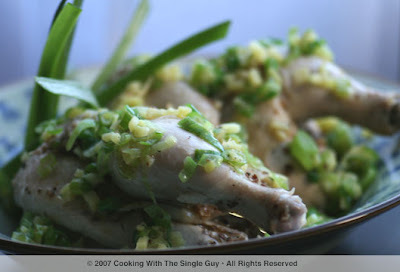 In a large skillet, warm sesame oil over medium heat, then add ginger and green onion and cook for maybe 30 seconds. Then pour the warm oil and ginger-onion mixture over your chicken. Makes one to two servings. Serve warm with steamed rice and Chinese vegetables and oyster sauce. TIP: Sichuan peppercorns have a distinct Asian flavor, maybe because it’s one of the main ingredients in Chinese five-spice powder. It’s best to use freshly ground peppercorns. If you want an even stronger fragrance, heat them briefly in a non-stick pan before grounding. STEAM THIS: If you don’t have a steamer, you can create one by simply getting a large pot or wok with some water, place a rack stand or hollowed out can in the center and place a heat-resistent plate on top. Cover and steam away. Open daily, 11 a.m. to 9 p.m., lunch menu until 4:30 p.m.
Gregoire Restaurant in Berkeley celebrated its 5th anniversary on Tuesday. Since I wasn’t on the invitation list (apparently the entire Berkeley neighborhood was invited to a block party), I ended up picking up some takeout from its Oakland counter, which remained open while their Berkeley counterpart celebrated. The location at Piedmont Avenue is less than a year old, and just like the original Berkeley location, quite small for those wanting to eat in. Which is why I’ve always been confused about why it insists on calling itself “Gregoire Restaurant.” I mean, it’s even in the name of its Web site’s URL. 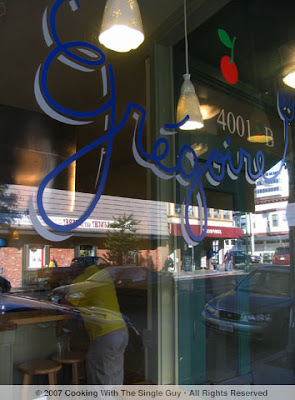 Gregoire’s Oakland location reminds me of a bustling deli. 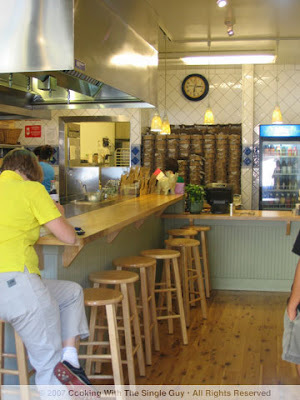 During busy times, there could be a line to the door as people order and wait for their food. The menu is French-Californian and changes every month. If you do decide to eat in, there are about 10 stools surrounding the stove top, so you get a front row seat of the chef preparing your dishes. Since I was coming in for takeout, I scanned Gregoire’s dinner menu on its Web site and called in my order by phone. It takes me about 15 minutes to walk to Gregoire from my apartment, just about enough time for them to prepare their Sauteed Rosemary and Garlic Chicken Breast with Fresh Morel Cream Sauce ($15). 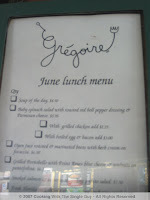 Gregoire’s menu changes every month and is posted on its Web site for you to study and dream about. The staff is friendly and sweet. Both times I went were early in the evening (around 6 p.m.) so it wasn’t extremely hectic. They provide your meals in this cute, very original, round cardboard containers that come with very classy biodegradable eating utensils. When I got home with my order last night, I uncovered my chicken and I have to say I was completely disappointed. When I think of rosemary chicken and morel cream sauce, I imagine half a chicken lathered with a light brown cream sauce. 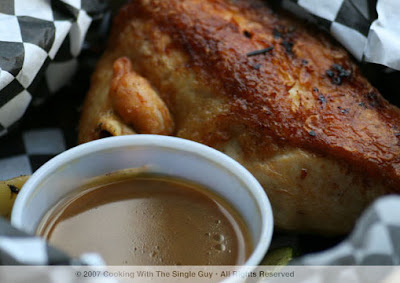 Instead, I saw a dry-looking chicken breast and this liquidly brown sauce in a container. At first I thought maybe they gave me the fried chicken special instead because the chicken skin looked so brown and fried. But I realized that it was the correct order when I noticed a few chopped bits of morel mushrooms at the bottom of the dark brown sauce (it was more of a reduction than a cream sauce). A couple of rosemary twigs and a bit of grain (polenta maybe?) were stuffed into the chicken breast, giving it a strong fragrance. Along with the one piece of chicken breast, there were two pieces of sautéed zucchini. I was really disappointed that that was all I got for $15. The morel sauce was on the savory side. I also ordered from its dessert menu the “apricot fold,” which was really a very long turnover. Because the chef is French, it’s not surprising to hear the puff pastry was very light and fluffy. However, it had an odd oil scent to it. It didn’t make it very appetizing. The filling was a thin layer of tart apricot jam. That was all I got for $4. 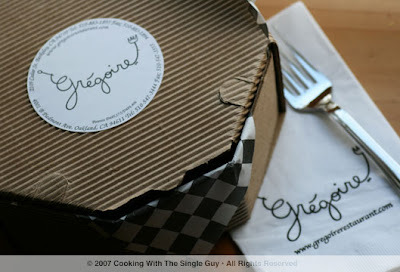 Gregoire is a nice addition to the neighborhood and a fancy option when I’m tired of going to KFC. (Hey, I spend less than $5.50 for its two-piece chicken with two sides. BTW, I know I say I don’t eat fried food, but I remove the skin when I order occasionally from KFC.) But because of Gregoire’s high prices and inconsistent menu, I would only go back maybe once a month just to see if there’s something innovative that I don’t feel like cooking myself that night. In this past week's The Next Food Network Star, the contestants made comfort food dishes for a group of Marines. My favorite comfort food is meatloaf, I think because I love mushing it against the mashed potatoes that are often served with it. Below is my recipe for meatloaf. It's actually an adaptation of a turkey meatloaf recipe by Ina Garten, the Barefoot Contessa. 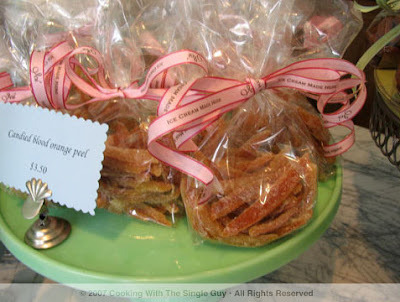 But of course, her recipe makes a lot of servings and uses a lot of ingredients. I pared down the serving size since I'm the Single Guy Chef, and added a few twists to it with chicken sausages I had in the refrigerator and sweet potatoes because they're good for you. (Sweet potatoes supposedly can help you prevent skin cancer.) I also think comfort food is eating what you like, and I like salsa so I use salsa to top my meatloaf instead of regular tomato paste or ketchup. This is a pretty healthy dish because of the lean turkey used and it's flavorful because of the added sausages (also lean). I served it with roasted garlic mashed potatoes with chives and sauteed broccotini. Enjoy! In a medium skillet, warm olive oil over medium high heat and then add onions and saute until translucent (about 1 to 2 minutes). Add sausage pieces to brown for about a minute and then add chicken broth, Worcestershire sauce, a tablespoon of tomato paste and thyme. Blend well, then set aside to cool to room temperature. In a large bowl, combine ground turkey, bread crumbs, egg, sweet potato, onion-sausage mixture, salt and pepper. (Works best when using hands, be sure to wash hands first.) Pour mixture into a 9X13 baking dish and shape into a loaf so it’ll evenly cook. Blend the remaining tomato paste with a cup of salsa and then add the mixture on top of your meatloaf, creating a smooth thin layer. 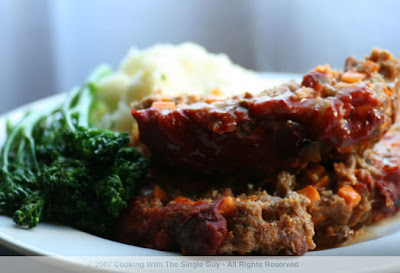 Place meatloaf into oven and bake until internal temperature is at 160 degrees (about 1 hour). Remove from oven and let cool for a while before slicing. Serve warm with garlic mashed potatoes and greens. TIPS: To check the internal temperature to make sure you’re at 160 degrees, you’ll need a cooking thermometer. If you don’t have one, then slice the center of the meatloaf to see if it’s cooked to your preference. PREVENTING CRACKS: I don't know if this really works, but a common tip to avoid cracks on the top of your meatloaf, especially if you create a layer of ketchup (or salsa as I've done) is to place a tray of water under the rack where you have your meatloaf. This supposedly will prevent major cracking because of the moisture from the steaming water below. SHRED IT: I added sweet potato because it’s healthy for you but I found that it blends in nicely when you shred them before hand. I tried dicing them and mixing it in, but that made my meatloaf break apart easily. So shredding the sweet potato in a food processor will help it blend with the other ingredients while still giving you those sweet bits. Previously on TNFNS: The contestants cook at a New Jersey Nets game and we learn that Michael Salmon is over the top, Paul spins out of control, and Colombe is not a food expert, which means she’s not the next Food Network star, so she’s out. Also, Tommy’s head isn’t in the game, but that doesn’t matter since he’s out too during this double-elimination episode. And tonight, southern mom Paula Deen is helping the contestants make home-cooked meals for a bunch of Marines, and bust out the tissue because this elimination round looks like a real tear-jerker! They all head out in the van, still half asleep, and eventually arrive at Fort Dix, New Jersey. That’s right, another episode in the city across the Hudson after last week’s episode at Nets Stadium. Of course, everyone thinks JAG has an advantage having been in the military. We’ll see. They walk into a hanger and there standing with two military personnel is Giada DeLaurentiis, which is weird because she was a guest judge two episodes ago. (Is the Food Network running low on stars to pimp with Tyler Florence cooking at Applebee's and Rachel Ray gabbing all day?) I’m not the only one that thinks it’s odd seeing Giada II. Amy comments that she’s surprised to see Giada, and in some weird editing, follows that with “I just know this is going to be an extremely bizarre challenge” like Giada is the bearer of bizarre challenges. JAG is already getting flashbacks of his military tour of duty. He talks about being around all the gear and how that’s making him feel uncomfortable. OK, if he starts to get all “Deer Hunter” on us, this is going to be a good show. Giada tells them today’s challenge is all about creativity. 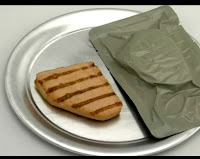 They have to reinvent a MRE, which is the “meal ready to eat” or what looks like astronaut food. Sigh, I feel so bad that this is what we feed our military for all the sacrifices they make for us. Anywho, the contestants have 20 minutes to create a dish using the MRE ingredients and then do a presentation. Rory says this challenge is important because being a Food Network star means having to adapt to any situation. Yeah, let me see Paula Deen cooking with MREs. JAG says he’s making a stew, which just looks like trail mix with water. Rory thinks her ingredients look like really bad TV frozen dinner, so not surprisingly, she’s freaked out. Paul is trying not to freak out like the last two episodes and is again talking himself into a chill. Time is up and the judges visit the various station. Up first is Amy, who made chicken breast with mac and cheese, with two pieces of shrimp toasts on the side. The military guy says the shrimp toast tasted “shrimpy.” Isn’t that a good thing? That’s better than if it tasted “porky”? Hoo-RAH. Adrien is up next and he took the pork rib dinner and sauteed it with pineapple and he took the clam chowder and added some roasted red bellpepper to make his “soup.” For dessert, he opened the pre-made packet of chocolate chip cookie and didn’t mess with it because it’s fine as is, in his humble opinion. The judges tasted everything and catty Giada is back because she says the cookie was the best thing. The other contestants follow with JAG’s very spicy beef stew, Paul’s chicken and Dijon-cherry glaze that was very yummy, Rory’s cooked stew and sloppy-looking peach cobbler, and Michael Salmon’s mac and cheese with crumbled pretzel bits in it. Mike’s highlight of his taped segment describing how he did in this challenge: he’s worried because he said “MRI” instead of “MRE” during his presentation. Shocking! In the on-the-spot evaluation, Adrien had the least flavorful dish (again with the bland food) and JAG failed with the presentation. (They are really following the Top Chef quick-fire challenges, even to the point of disclosing the least favorite and most favorite.) The winner is Paul, for both flavor and presentation. Commercials. It’s the Hilton commercial again where they draw a dragon between points A and B. I. LOVE. This. Song. I had to do some research and was able to find out that the singer is Michael Tolcher, who’s featured doing full and acoustic versions of the song (called “Voila”) on the Hilton site. Unfortunately, it doesn’t look like Tolcher has released “Voila” on any CD. I would so buy that song if it were on iTunes. They move to the next challenge and Paula Deen arrives, and of course, everybody loves her. (Except me. I have to admit I can’t watch her show. She cooks with too much butter and fat. But she does seem nice though.) Paula gets right down to the challenge and tells them they’re going to be split into teams of two and each team has to make a home-cooked dish the soldiers listed as their favorites: lasagna, meat loaf, and chicken pot pie. (Mmm, I agree on all counts. I’d also add roasted chicken and chicken soup.) They have to cook the dishes for 75 soldiers and also do a three-minute presentation. Since Paul won the earlier challenge, he gets to pick a partner and what dish to cook. And I don’t know why, but the editing made it sound like Paul said “Jag-JAG” when choosing his partner. But basically he just got one JAG, who is the perfect sous chef. He then has to create the remaining teams, and Paul does the typical girls and boys team, so that means Rory and Amy and Adrien and Michael. Paul has too much power it seems because he’s also given the responsibility of assigning what the remaining teams will make. Since he and JAG chose meatloaf, he gives lasagna to the girls and pot pie to the boys, thinking lasagna is easy and pot pie will screw one of the guys because he wants more bed space in the dorm and his strategy is to get one of the guys eliminated. Now that’s now playing nice, Paulie. They start cooking and Michael is bossing Adrien around. Meanwhile, JAG and Paul are moving like fire with their meatloaf dish. Wow, Rory just described her partner Amy as “a little organized, a little snooty.” Then she calls herself a “party girl.” Yes, we all remember the low-cut sweater in last week’s stadium challenge. Anywho, Amy says that when you combine both of their personalities, you get a normal person. Amy goes looking for sugar, but turns out she wants brown sugar instead of “regular” white sugar. I think Amy may be a wee tad OCD (obsessive compulsive disorder). Paula comes in and Amy’s still bummed about the brown sugar. Oh. My. Gawd. These mini-crisis among these contestants are soooo boring. What? No brown sugar? Come on, give me some real tension! Why is comfort food always so unhealthy? I just saw Rory pouring oil over her sliced garlic bread. Paul and JAG are really working well together. You can tell by the way they’re singing together over the pot. Rory calls them the odd couple. Another boring mini-crisis: Rory can’t get the pasta out of her industrial-sized boiling pot, and she needs to get the pasta out before it overcooks. She and Amy use scoopers to get out the pasta and run it under cold water to keep it from cooking further. Whew, another boring mini-crisis averted. Commercials. Ugh, there are so few new commercials on this network, I just can’t comment on them anymore. Just go listen to Michael Tolcher’s beautiful, spirited “Voila” tune from Hilton.com. JAG is still stressing about the oven, so he panics and pulls out still raw meatloaf. Paul is now beginning to see the picture and he makes this funny line of how they can’t serve raw meat because “it’s not the Paul tartar show.” This is even more funny because of last week’s incident when Paul had undercooked hamburgers in the stadium challenge. So what happens? JAG says he has to deep-fry the meatloaf. As Scooby Doo would say, whOOOH? In goes the meatloaf into the deep fryer. Bacon strips that was laid on top are floating off and up, everywhere. Adrien is making his dessert, but all his frozen fruits are still in ice stage. He tries to run them under water, but Michael Salmon bosses him not to do that because it’ll dilute the flavor. So he says just leave them on the pan and hopefully it’ll be thawed by dinner time. Time’s up. The finalists now have to make their presentations to the Marines. First up are Rory and Amy and they do some loud Military-shouting routine. They both work the girl element with the soldiers like some USO performance. Amy voices over that it helps that Rory is stacked. See, even other women notices Rory's breasts. Then it’s Michael Salmon and Adrien. By the way, poor decision by Adrien in wearing a neck-high zipper sweater in a hot kitchen. Even I felt hot watching him (or maybe it’s the 60 degree evenings here in the Bay Area). Adrien does the nice gesture of thanking the soldiers first, and then talks about their chicken pot pie with deep-fried potatoes for a crust on top. After talking about their dishes, Michael talks about growing up during the Vietnam era. It was an uncomfortable effort that didn’t really go well with the crowd. Stop with the politics, Michael. Commercials. Yay, they’re playing the Hilton Michael Tolcher commercial again. Have I told you guys to listen to this song yet? I’m going to make this guy a star if it’s the last thing I do. The soldiers chow down. The finalists interview their thoughts: Amy feels she’s getting closer to the end and she can just taste the prize; JAG is still upset about the oven (let it go, JAG); Michael Salmon thinks he’s swept all the challenges thus far and is in good shape of winning, which is really odd considering that he’s never won a challenge; and Adrien doesn’t feel good about his frozen fruit or this challenge. The judges are eating together in a booth in the mess hall. Bob Tuschman loves the crispy crust on the meatloaf and so does Susie Folgelson and Giada. But not Paul Deen, who says the meatloaf is her least favorite. (She didn’t like the herbs inside.) But she did like the sweet potato mash Paul and JAG made for the meatloaf. Bob thought the pot pie was gloppy. And everyone realizes the frozen fruit is still frozen. And of course, Miss Everyday Italian doesn’t like the lasagna, which she says is average and doesn’t go “pow” in her mouth. Oooh, wait till Rory finds out. Then something will go pow in someone’s mouth, I bet. They interview some Marines, and just like the Stadium challenge last week, the editors mix in comments that are positive and negative for everyone. Useless. Rory says in her taped interview that she’s worried that JAG is self-destructing with his constant venting about the unusable oven. “We feel that the whole Jekyll-and-Hyde thing that the committee has warned him about is happening right now.” Dun-Dun-DUH. And now, prepare for the most shocking, sappy, tear-jerking rose ceremony ever! Oh, I mean elimination round. Giada asks Paul and JAG about the oven. JAG explains that they deep-fried the meatloaf, and the judges realized that’s why they liked it. (Who doesn’t like deep-fried food? Oh, me. That’s right. Forgot.) Giada says the Marines all loved Paul and JAG’s presentation. Giada says she wants to see happy JAG, and Bob Tuschman gives the harshest comment ever when he tells JAG that when he’s not smiling “you’re really unpleasant to be around.” Giada tells JAG not to lose his cool. JAG gets emotional talking about how it was difficult going back to the military after going through a lot when enlisted. And he almost breaks down. Giada gets sensitive and she apologizes to him that the challenge made him feel uncomfortable and then she gives him some really positive, supportive advice about dealing with situations and challenging his demons. Wow, gone is catty Giada. I give this critique an A+. Sensitive tone. Supportive suggestions. Upbeat conclusion. Bob critiques Paul, and says he went from Jack Russell Terrier last week to “Best in Show.” OK, I hope this is the last of the dog analogies. Anywho, Paul gets compliments on both his presentation and food tastes. For Michael and Adrien, the peaches were frozen (we know already) but the judges loved the crusty pot pie cover. 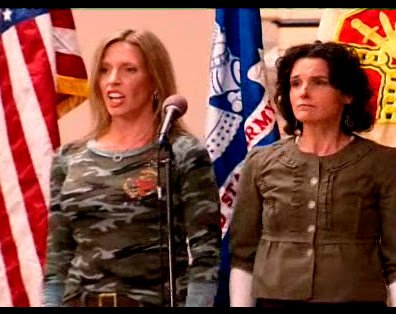 But the presentation was awkward and Susie says the Vietnam reference was disingenuous. (She means he’s insincere, like a used car salesman.) Bob asks Michael for his culinary point of view, and Michael gives this weird answer about how his culinary point of view has always been a bit elusive. Leading Susie to say: “you mean you don’t know.” Michael has to back pedal and explains that his culinary point of view is to let the food talk and he’d just give a few behind-the-scenes cooking tips here and there. Oh, great. Let’s just have a show with talking vegetables and forget about this Salmon guy. Adrien says he thinks he’s still around because he’s comfortable in front of the camera but doesn’t want to be out there like a “jackass.” (I think he was referring to Mike Salmon.) But Susie says she wants to see more of a jackass, which probably explains some of the really loud personalities on the Food Network (who will remain nameless). Then the girls. Bob calls Amy rigid and predictable because of her organizational skills. Rory is nervous and gets teary eyed about being so close to being a star. Susie says she’s bubbly but superficial. Giada says they need to see the contestants undergo a soul-searching moment, which gets the waterworks going. Amy is crying and she says she’s found it really hard to understand the crossover between what’s private and public (reality show vs. her kitchen), and that it’s a lot to process. She concludes there isn’t a distinction between a public and private life, and that’s where all this becomes really. She breaks down, and then Michael Salmon cries (ugh, how disingenuous), and tries to get into the crying game and says he recognizes what they all need to do and that this is the most challenging of all the challenges. The elimination. It’s obvious that Paul and JAG did really well, and the soldiers voted their meatloaf the most popular comfort food, so they are both safe and will continue on. Amy and Rory’s dish wasn’t popular but they gave a strong presentation, so they’re both saved. The four gets dismissed, leaving only Michael Salmon and Adrien. Susie says they’re both extremely brave for coming out and putting things out for us, whatever that means. And she says that Adrien will stay, so Michael goes home. But of course, she messes the ending and says “you can both go” but says it in a way like, “I am so tired of both of you and I wish I could eliminate both of you. Just go already.” That’s not what she said, but that’s how it came off. Next on TNFNS: Alton Brown guest stars and the contestants cook with their least favorite ingredients. Amy has a bleeding finger (or is that ketchup?) and they all do a demo by themselves and all I can say is Paul is flaming (and I don’t mean his cooking). Tomorrow: See which comfort food dish I make for the men and women of our armed forces. Photos courtesy of the Food Network Web site. If you find yourself going for Chinese take out often for your lunch because it's cheap, well, try this next time and you don't have to worry about the extra oil or MSG often found at the cheap Chinese places. Enjoy! In a small bowl, marinate the chicken pieces with white pepper, sesame oil, Xiao Shing wine (or cooking Sherry) and soy sauce. Set aside for about 10 minutes. 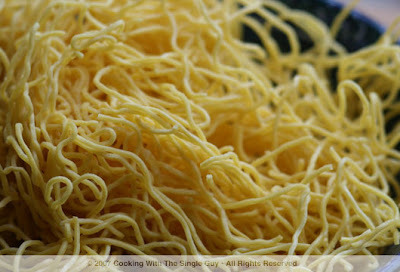 Rinse your noodles with hot water (or you can dip it briefly in a pot of boiling water) and then drain in a colander. Set aside to let dry. In a large wok or skillet, warm oil over high heat and then add noodles. (You may need to separate your bunch of noodles into two bunches.) Sprinkle a pinch of salt over your noodles and pan fry into almost like a cake. Flip to crisp the other side. (About 2 minutes each side.) Place your noodles onto a serving plate. Heat some more oil in the wok, then add the chicken and brown all the sides for about 2 minutes. Remove chicken and set aside. Heat more oil again in the wok (for the last time) and then add the garlic and onion over medium high heat and saute until translucent, about 2 minutes. Then add the bellpepper and mix in the black bean sauce. Add chicken and blend all the ingredients together. In a small bowl, mix the cornstarch with the water to create a slurry. Slowly add this mixture to your wok to create a sauce. Make sure your wok is on high heat. If your sauce gets to thick, just add more water or broth. 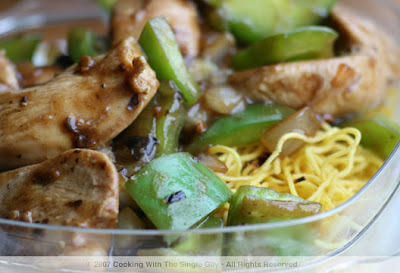 Finish off your stir fry mixture with the oyster sauce and then pour everything over your plate of noodles. TIP: If you buy fresh chow mein noodles, you don't have to worry about pre-cooking it in boiling water. The only reason I suggest that is to get rid of the flour-taste that's on the fresh noodles. I personally like the "steamed chow mein" I find at Asian stores from Elmonte, Calif. If you can't find chow mein, you can substitute with thin angel hair pasta or vermicelli. 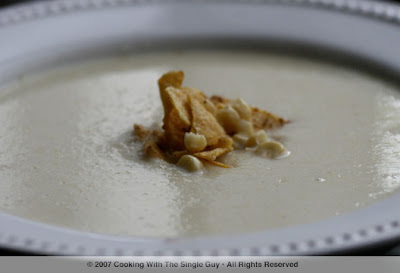 Summertime brings a lot of fresh corn on the cobb, and I recently made this sweet creamy corn soup using fresh sweet white corn. I love the flavor of sweet corn, so this soup is so easy to make because of the natural sweetness of the corn. It's important, though, to put the soup puree through a chinois because of the pulp of the corn kernels, which is hard to avoid. So for a creamy soup, you have to do this extra step. But overall, the ingredients are simple and you're rewarded with a sweet summertime soup. Enjoy! Roast or grill corn in oven or open grill to char it a bit. If roasting in oven, just drizzle with extra virgin olive oil and place in 375 degree oven for about 15 to 20 minutes. Remove corn kernels from the cobb. Set aside (leaving a few kernels for garnish). In a saucepan, warm olive oil and saute onion until translucent, about 2 to 3 minutes. Add chicken broth and bring to a boil, then reduce to a simmer and add corn kernels, simmering for about 10 minutes and then pulse with a hand blender. Get a chinois or other screen and run soup through screen to remove any corn pulp. In the corn soup, add heavy cream. Season with salt and pepper to taste and then serve with tortilla garnish and some corn kernels. Pair with a glass of cold beer. 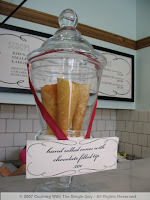 TIP: The chinois is a screen in a cone shape. This is used a lot of times for soups or purees to get a smooth texture by removing any pulp or bits. You can also use a tamis which is a flat screen in a circle shape that fits over a bowl. ADD A TWIST: To create a different taste dimension to your creamy corn soup you can add a tablespoon of either fish sauce or lime juice. Just be sure to add it with the soup off the heat so the cream doesn't curdle from the tartness. When I did a review of the new Vietnamese restaurant Kim Huong in Oakland’s Chinatown, I focused mostly on its Hue-style dishes, not the ubiquitous pho (pronounced "fuh") soup noodles. But I wanted to go back and taste Kim Huong’s pho to see how it compares to Pho Hoa Lao II, a popular and more established pho joint that’s right across the street. 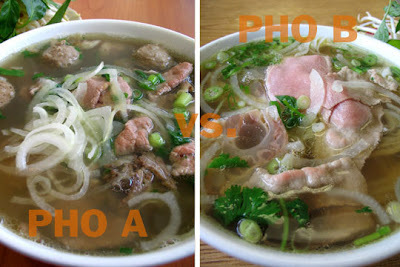 To me, it seemed like the perfect setting for a battle of the pho. So for lunch today, I went to do a taste test. Because I couldn’t really do a side-by-side comparison, I basically ate two bowls of pho back to back during my break so that the tastes from each dish would be fresh in my mind. First up was Kim Huong, the new kid on the block. I ordered a small bowl (I had to save room for a second bowl of pho) of the “Special Combination Beef Noodle Pho” for $5.50. Five minutes later, I got a steaming bowl of pho with the side plate of bean sprouts, Thai basil, jalapeno slices and lime wedges. The noodles were stuck together in a block, but I easily wrestled them loose with my chopsticks. I threw in a few bean sprouts, jalapeno and basil and started enjoying the light noodles, sweet broth and meaty delights. The special combination came with meatballs, thinly sliced flank steak, tripe, tendon and brisket. 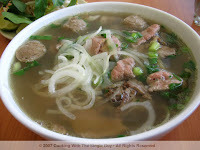 Kim Huong does a nice touch of adding very thinly sliced onions on top of all its soup noodle bowls. I enjoyed the soup and pho, but the meatballs were rubbery. Still, there was a lot of meat in my small bowl. My score for Kim Huong: décor, 3; service, 3; pho, 3; for a total score of 9 out of a possible 15. Side note: Kim Huong sells its Special Combination pho in a very large bowl for $6.75. It took a few minutes longer to get my bowl of pho, but when it came out, it was much more prettier than Kim Huong's. Despite being in a smaller bowl, the specialty meats were arranged nicely on top in their own sections so you knew what was in the special combination. There were thinly sliced rare steak, well done flank steak, brisket, tendon and tripe. 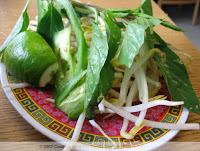 The side plate of bean sprouts, basil, jalapeno slices and lime wedges were more roughly presented than Kim Huong. The pho noodles were bunched up together just like Kim Huong’s (must be the mass production of pho) and the soup had a similar sweet taste to it like Kim Huong’s, although I felt Hoa Lao’s soup was just a tad watery. 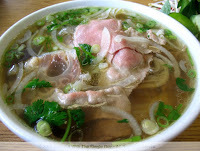 Where it really shined was in the thinly sliced rare meat, which I believe is a true sign of a good bowl of beef pho. The meat at Kim Huong were overcooked. The tripe in Hoa Lao’s pho were also delicately shredded, which made it easier to eat. My score for Pho Hoa Lao II: décor, 2.5; service, 2.5; pho, 4.5; for a total of 9.5 out of 15. So the winner of the Battle of the Pho on 10th Street in Oakland goes to Pho Hoa Lao II with just a slight edge of half a point. Really, the beef and accompanying parts were much better even though the noodles and soup were virtually identical at the two places. While Pho Hoa Lao has the better-tasting pho, I have to say Kim Huong has the better value because its large orders are $6.25 compared to $6.90 at Hoa Lao. So for value, Kim Huong wins on that count. Basically, you can’t go wrong at either place. And both in just one little street in Oakland Chinatown. P.S. I was so glad to have that 10 blocks to walk back to my office after lunch. Kim Huong, 304 10th St. (at Harrison), Oakland. PH: 510.836.3139. To make the aioli, get the roasted garlic from the oven when done. Squeeze out all the cloves and mash them with a wooden spoon against a bowl. Then whisk in the egg yolk with mustard, mayonnaise, vinegar and chives. Slowly add the olive oil in a steady stream to emulsify into a creamy dip. Add enough oil to make as creamy as you like. Season with salt and pepper. Refrigerate until ready to serve. For the potatoes, season with sea salt once you bring them out of the oven and while still hot. Leave in paper-lined basket to remove any excess oil. Pair with a cold beer, preferably a lager. TIP: When using raw eggs, make sure they're organic or very fresh and avoid touching the egg yolk with the outer shell. If you're squeamish about using a raw egg, then adding the mayonnaise should be sufficient to create a cream base. NOT FOR THE VAMPIRES: The roasted garlic in the aioli will give you a nice garlicky taste. But if you want to get the smell of garlic too, then finely mince about two cloves of fresh garlic and toss that on top of the hot potatoes the same time you season with the sea salt. Previously on TNFNS: The contestants compete for the cover of Bon Appétit’s July grilling cover. Colombe gets ditsy. Paul demonstrates deep breathing exercises. 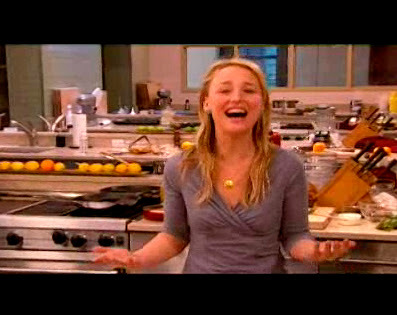 And Giada tells Adrien that his food isn’t very good. Ouch! Nikki is labeled a “phony” (by Bob Tuschman, not me) and sent packing. 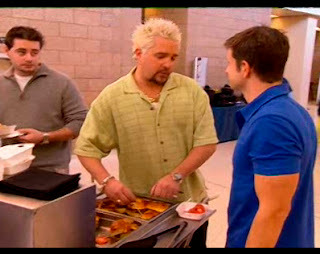 Tonight: Guy Fieri guest judges and he delivers the news that two will be going home. Tommy cries talking to someone on the phone and they’re cooking for fans at a New Jersey Nets game. The editors skip the usual opening of New York City scenes and instead go straight to the carriage house where the camera shows a shirtless Adrien in bed talking about how he’s not sleeping well. Neither is big boy Tommy. Common denominator? They’re both dads and today’s Father’s Day and they’re away from their kids? OK, I know this was filmed earlier and they’re probably at home now watching the episode with their families, but I wanted to throw in the Father’s Day connection. Looks like Amy is missing her kids, too. How long have these people been together? It’s only the third episode. 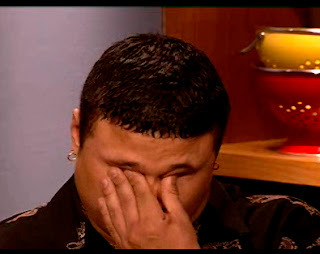 Tommy is in the sleeping area talking with his wife on the phone and he’s crying. Sigh, the big lug. He says in his interview that he’s torn between being with his family and staying in the competition. What do you think he’s going to choose? You’ll find out at the end of this recap. Dun-dun-DUH. We cut to Colombe, who’s looking in the pantry for cinnamon. And while I know what she was trying to say, her quote just doesn’t make sense. Here it is: “Where might I find cinnamon? They’re all alphabetized.” Um, I guess you would find it after the basil but before the dill? When time’s up, the finalists are told they have to do a 30-second presentation in front of the selection panel, and their presentations have to include some kind of chocolate tip. In comes Bob Tuschman and Susie Fogelson to join Guy and Darryl Dawkins. First up is Paul, who needs to redeem himself from the previous week’s disaster. He made what he calls a “Chocolate Thunder Pie” or what I call a “kiss up to the judge” pie. It’s molten chocolate in a phyllo cup with vanilla and honey. He goes over the 30 seconds by just a second but at least he didn’t waste his time just taking deep breaths. Much better than last week. And Susie is digging the molten chocolate. Next is Tommy, who made a cocoa-encrusted pork tenderloin with butternut squash and banana ravioli. Wow, a whole lot of fruits and meats and savory and sweets mixing together on one plate. You’d think Tommy would have a lot to say. 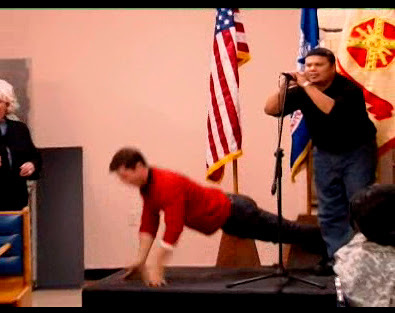 But he ended up short on his 30-second presentation as the judges sat for 5 seconds (five. really. long. seconds.) watching Tommy stand there in front of the camera not saying a word. It was like watching paint dry. And boring white paint to boot. Later, Bob Tuschman makes a weird face after biting into Tommy’s cocoa-encrusted pork. The other contestants roll in. The highlights: JAG makes a chicken tempura on a skewer with chocolate mole. (He throws a two-hand kiss at the end to the camera. Really, I don’t need my Food Network stars throwing kisses at me.) Adrien makes chocolate barbeque pork and Susie says she doesn’t taste any chocolate in the sauce. Amy makes a French pastry, of course, but talks too much about her husband before getting to her chocolate tip. And Colombe gets excited about chocolate, but Darryl Dawkins doesn’t finish her chocolate brioche. Michael Salmon is too busy kissing up to Chocolate Thunder instead of talking to the camera. Commercials. Mercury Mariner. Big. Mercury Mariner. Bad. It is not on my list. Challenge No. 2 (we have to wait till the end to see who won the chocolate challenge). Guy tells the contestants they’re going to invent or put their own spin on traditional stadium food. And they’re going to serve their creations to New Jersey Nets fan. Everyone seems excited. Maybe they thought they’d actually get to watch a game. When we’re back at Food Network kitchen, Paul is missing some of his ingredients. A whole bag of ingredients. Poor muchacho. When he’s looking for it, he says he hears Colombe talking about how she had seen an extra bag and left it at the store. Paul’s really pissed, and you can tell because he’s doing this really weird surfer girl imitation of Colombe. Guy Fieri checks in with Colombe and finds out she’s adding a fresh touch to cheese nachos. Where’s the cheese? Fieri asks. She says it’s in a jar. She’s going to serve it with natural tortilla chips. Are you making your tortilla chips? 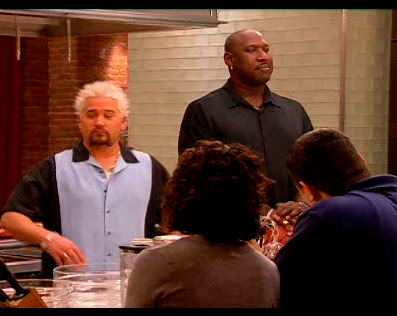 Fieri wonders. No, it’s in a bag, Colombe says. She goes on to tell Fieri that she’s “cooking” the pico de gallo, which is like a pineapple salsa to go with the nacho and cheese. Amy is really in “mom” mode telling Colombe how she should have handled the situation. Colombe calls Amy “little Miss Perfect.” And Amy gives her a timeout. The next morning, they head over to the Nets stadium, which I’m assuming they had to cross the river to go to New Jersey. They have 45 minutes to prep their food cart stations before the fans arrive. I’m wondering what basketball game occurs at what looks like 10 a.m.? It’s apparently the pick-on-Colombe episode because we see Rory getting on Colombe’s case for opening up a heating cart (called the “holding area”) that apparently all contestants are using. Colombe’s going to get something of hers, but Rory is using the “heater” to cook her food. In Colombe’s defense, that cart apparently is a shared utility among all the contestants, so no one contestant should be using it for his or her own cooking. So Rory shouldn’t get mad if another contestant needs to get something from a common area. This is how I see the debate playing out before Judge Judy when Rory sues Colombe for ruining her chances to be the next Food Network star. There’s this funny scene where Paul has so much prep to do that he’s talking to himself running over his list of things to do, but Tommy is right next to him not saying anything at all. Colombe is pretty much done with popping open her jars of cheese and breaking open the bags of tortilla chips, so she goes and offers to be the sous chef for Paul, who’s now totally all fine with her after that generous gesture. So the Nets fans arrive for “the game.” I really don’t think there was a game. I think they were just told there would be free food. Anywho, all the contestants are trying to get fans to taste their food. The fans vote for their favorites, so the contestants really need to pimp their food. Someone who’s really selling it is JAG, who totally looks like he could be selling peanuts at the ballpark. He just has that loud, shouting voice. Commercials. Oh my. They’re already looking for contestants for next season’s The Next Food Network Star. I am not applying again, just in case you were wondering. I don’t deal well with rejection. Back to the arena, Paul is busy frying up his hamburgers. This woman is mad that there’s no burgers and she’s at the burger cart. Paul says he feels like a short order cook. Everyone’s busy selling their stuff. Then the judges come to check out the food court, and of course they go first to Paul, who’s busy cooking. He serves up his “Hawaiian burgers,” which looks like a burger with a grilled pineapple, some greens and finished off with some barbeque sauce. The judges ask what makes the burger Hawaiian, and Paul says the pineapple, and then he goes into this weird hula dance while singing, “Aloha Oe.” I’m surprised that he even knows the word to the song “Aloha Oe,” but I give him deductions for that odd hula swaying. When they get to Colombe’s nacho and cheese, there’s a fan off to the side commenting, “oh, it’s just nacho and cheese.” I guess they expected some duck confit with it. Adrien is passing out his mushrooms wrapped with bacon. Such a simple dish, but apparently everyone loves it because they can just pop it in their mouths. Adrien says it was such an incredible experience to serve food to fans at a stadium. Maybe he should just get a job as a concessionaire. They interview fans and, of course, they edit it so that each one had a favorite and it seems like each contestant got a vote (except it looks like Adrien’s mushrooms are especially popular). Commercials, before they go to the elimination round. When did M&M’s start wearing wigs? Creepy. The contestants all file into the elimination room. Susie is especially peppy this week. Maybe she read my comments about her being disengaged last week. (Yeah, right.) Guy announces that the winner of the chocolate challenge is JAG with his chicken tempura skewers. They liked the food but also liked his 30-second presentation (including the kiss throw at the end?). Then Guy announces that the winner of the NBA challenge is Adrien and his bacon-wrapped mushrooms—a fan favorite and Bob Tuschman’s as well. Both guys are safe and are excused from the room. Now they focus on the critique of the remaining contestants and it went something like this: Mike Salmon didn’t really work the camera and when he does work the crowd, he comes off like a used car salesman; Colombe thinks her food tastes good but Susie doesn’t, so she’s suspect about whether Colombe really knows what tastes good, plus she called Colombe loud; Amy should have sold her quesadilla in San Diego where she’s from and not New Jersey (again, very little critique this week for Amy); Rory is “approachable” with her kitchen klutz routine, but that can come off as not authoritative; Tommy is just not there (he says he never leaves his family, which is nice, but again, did he read the application form? ), and Bob thinks Tommy came off angry on camera and he was disappointed that he didn’t get the Tommy he knows; and Paul’s dishes were tasty in both the chocolate and NBA challenge, but his personality is too frenetic. Susie says that’s not the kind of energy they need at the Food Network (although it would work for Iron Chef America, IMHO). Commercials. Is anyone going to watch that movie with Catherine Zeta-Jones as a competitive executive chef? Doesn’t look too interesting. So the judges tell which contestants are safe. Mike Salmon, Rory (who is again near tears) and Amy (who breathes the same sigh of relief as last week). Bob sends them away, leaving only Colombe, Tommy and Paul. Then Bob says Colombe will be going home. I kind of expected it even though I thought the show is a lot more fun with her on. Of course, Bob doesn’t really say much about why Colombe is leaving. She thanks them and when she gets upstairs, she tells everyone “bye,” and Amy asks, “So what did they say?” (wanting to know why the judges let her go) and Colombe replies simply, “They told me to leave.” You can’t fault Colombe for not following instructions. That leaves Paul and Tommy and you know who’s leaving. Susie says Paul is staying and Tommy is going home, and he looks soooo happy for the first time in this hour. Tommy really was already home in his mind. As Tommy heads upstairs, Paul is left with the judges and Guy gives him some advice, saying that Paul has charisma and personality but that he shouldn’t “spin it out” with his frenetic energy that he’s displayed so far. Of course, Paul’s mind is probably going at warped speed because he repeats the advice Guy just gave him, “OK, don’t spit it out.” No, Guy corrects him, “spin.” Sigh, Paul, Paul, Paul. Of course, then Paul spins around to leave the room in this mad dash that’s cute and funny all at the same time. Next on TNFNS: Looks like they’re cooking for some military personnel, and Paula Dean is coming in to talk about home cooking. Paul wants someone out of the house, and Miss Giada is back as a guest judge. Tomorrow: See what I would have done in the stadium challenge. Occasionally I'm going to post a photo just for the heck of it. I love taking pictures and get inspired by the natural colors of fruits and vegetables. 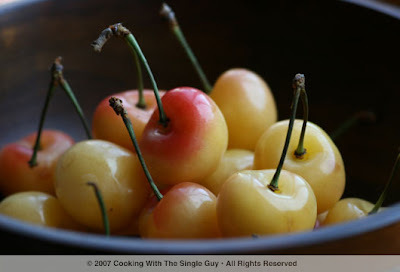 These rainier cherries I saw at the farmers' market were so pretty I had to photograph their blushing shades. Of course, you could dip them in chocolates like I did the other time and then you can eat your models. :) I call this photo, Rainier On My Mind. Grilling is so great because it’s so simple. Basically just season your meat with salt, pepper and oil and you’re good to go. When it’s hot, it’s nice to have salmon steaks because they feel light and healthy. And salsa is a nice summertime condiment. Below is my simple directions (I can barely call it a recipe, it’s so simple) for mango salsa. Enjoy! In a small bowl, blend mango cubes, red onion, cilantro and lime juice with a pinch of salt. Cover and refrigerate until ready to serve. Season your salmon steak on both sides with salt and pepper. Drizzle with olive oil on both sides, and then place on a hot grill or grill pan. Cook until done (2-3 minutes each side). 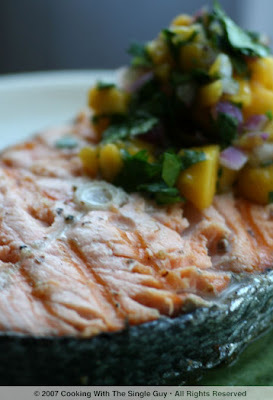 Plate your salmon with your salsa. Makes one serving. TIP: The onion has less punch when it sits in the juices of mango and lime for awhile. So you should refrigerate for at least half an hour. You can use your leftover mango salsa to go with tortilla chips or on top of toast like a crostini. GRILLING SALMON: It’s tough grilling fish. That’s why it’s best not to touch the fish and to flip it only once. Use a metal spatula to flip your salmon steak, not tongs. Open lunch: Mon.–Fri., 11:30 a.m.–2 p.m.; Dinner daily, 5:30 p.m.–10 p.m.; happy hour, Mon.–Fri., 4–6 p.m.
Hawthorne Street always sounded like an inspiring place to stroll, like you’ll see all these literary types visiting quaint bookstores or tea shops. But in San Francisco it’s really just an alley, and for many years the primary destination for the restaurant Hawthorne Lane. I never made it to the original Hawthorne Lane (just a stone’s throw from the W Hotel), but recently I visited its reinvented version known simply as Two. 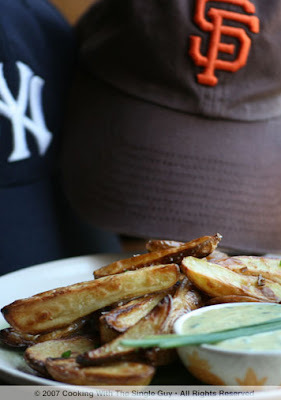 Two (named in honor of the two chefs—David Gingrass and Bridget Batson) is a casual, eclectic place (it has deer antlers for a chandelier) that wants to be on the cutting edge of San Francisco cuisine. So what that means is there is a lot of experimenting on the menu, which can be delightful, surprising, and odd all at the same time. I visited Two with my friends David and Ann after work one weeknight. I wanted to catch up on their trip to Italy. We made reservations to make sure we’d get a table, and I arrived to find David and Ann already enjoying themselves at the large bar in the center of the dining room. They gave rave reviews about the friendly bartender. For dinner, we decided to order a few dishes to share. 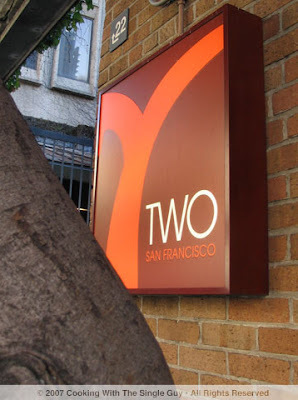 Two has an eclectic menu highlighting Californian seasonal ingredients, with a few small plates to encourage sharing. Because we each got to taste a little bit of everything, I’m doing my review in a different format this time. I’m going to do a critique of each plate as they arrived. Chilled salmon salad and sweet pea puree on sourdough crostini ($8)—We started with this crostini to get the spring freshness of peas. David loved this more than I did. 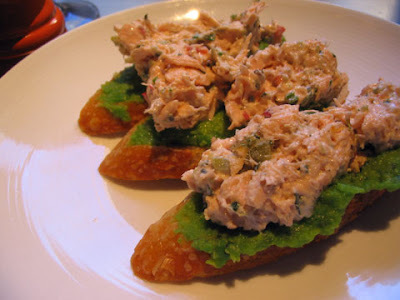 It was simply salmon flaked into a salad and placed on top of the crostini. While it was OK, I just kept thinking that I could have done this myself at home with some canned salmon and mayonnaise. It was a straightforward dish with very little other taste profiles to intrigue my taste buds. Bread platter (complimentary)—I just have to give some space to the fantastic bread plate that came out looking like a shark. The biscuits were wonderful and the lavosh crackers were a nice contrast. 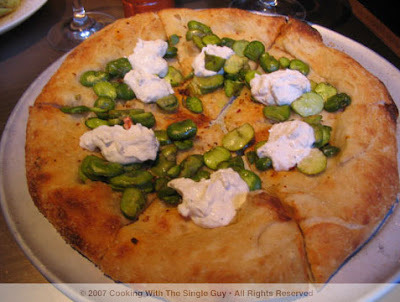 Fava bean pizza with lemon ricotta and Parmesan ($13)—There were several pizzas on the menu, but we went for the seasonal fava bean (and I love lemon ricotta). This was disappointing. First, because the cornmeal-dusted crust was chewy. Second, because the fava bean flavors weren’t as bright. And thirdly, because they basically just dumped the two ingredients on top of the pizza and didn’t allow it to blend into one cohesive dish. My 5-year-old nephew could have created this. We didn’t bother finishing the whole pie. 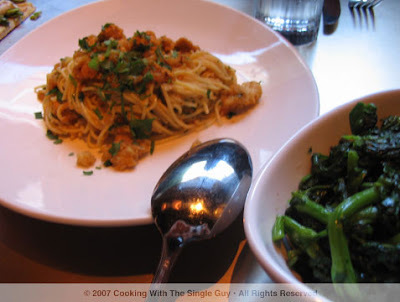 Spaghettini, sea urchin, brown garlic, chili, parsley ($10/$18) with a side of stewed broccoli rabe ($5)—I saw this on the menu on Two’s Web site when I was studying up before our dinner and I knew right away that I needed to try this. It sounded so adventurous and unusual, and I consider this the signature dish for Two. 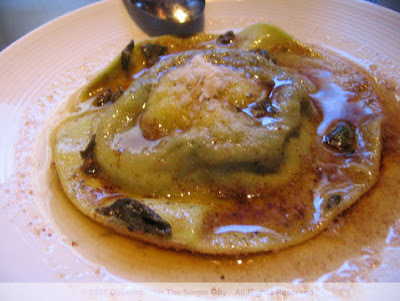 It represents the kitchen’s Italian influences and Gingrass’ wish to be seen as an innovator. The sea urchin was cut into bits and deep fried (I know, but it was good) and tossed in perfectly cooked thin spaghetti. 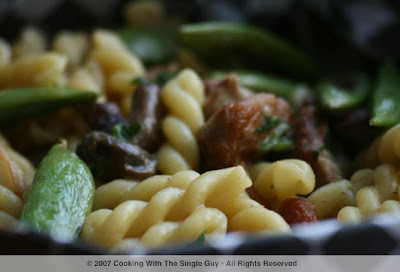 I judge really good pasta by how all the ingredients blend and stick together, both on the plate and in my stomach. This was a very satisfying dish that’s best eaten right away. 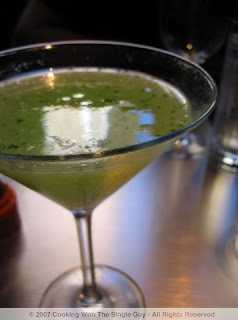 The broccoli rabe, BTW, was nicely prepared and gave us a good shot of green leafy vegetables for our dinner. Roasted half duck on the bone with apple rhubard chutney ($19)—You know what I say about duck on the menu, got to have it! This was a nicely cooked duck but it was underwhelming. I could have gotten something more tantalizing in taste from Chinatown just a few minutes north. 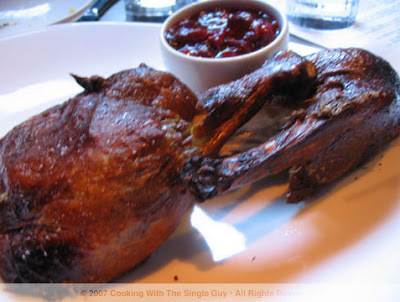 The duck was simple and the chutney was tart like cranberry. Side note: Service was excellent in all areas. They really make an effort to make you feel comfortable. Two is also one of the restaurants in town with the popular communal table (which happened to be taken up by a private party on the night we were there). Communal tables are great for solo diners or out-of-town diners who’d like to meet other foodies. Two is an interesting food destination because it also offers cooking classes and kitchen tasting menus through a lottery on its Web site. (I added my name of course but I'm still waiting!) 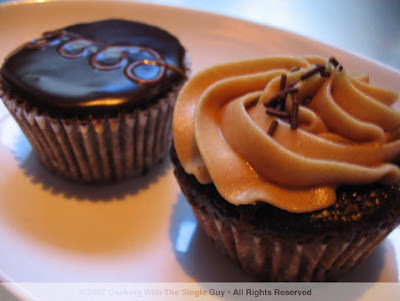 It also promotes an active take-out business (which is smart for the business people working in the area) and they said the cupcakes are available for order! 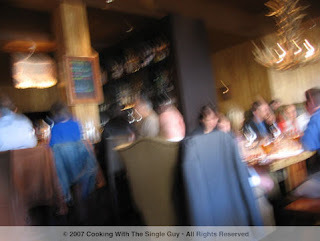 My conclusion about dinner (I’ll let David and Ann chime in with their comments in the comment section) is that Two is a fun place for drinks and some small dishes (especially the sea urchin spaghetti, with maybe a nice Chianti) or an after-dinner place for dessert (cupcakes for sure!). The pricing is reasonable so you don’t feel stressed about ordering many different dishes. Two isn’t really a place for a more traditional dinner experience, and maybe that’s what the owner wanted. When redefining Hawthorne Lane, maybe he wanted to redefine San Francisco’s eating experience? As long as he offers a few strong dishes, I’ll still be a willing guinea pig. 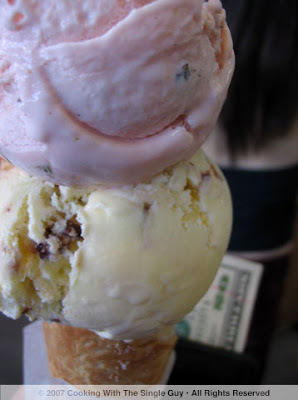 We’re getting an early preview of summer in the Bay Area right now with the heat, so you know everyone’s thinking about ice cream, sorbet, gelato and other ways to cool off. I rarely eat ice cream because I’m not big on sweets (or fat), but there’s always something nice about a smooth, hand-made ice cream or gelato as you’re walking around the neighborhood on a beautiful sunny day. 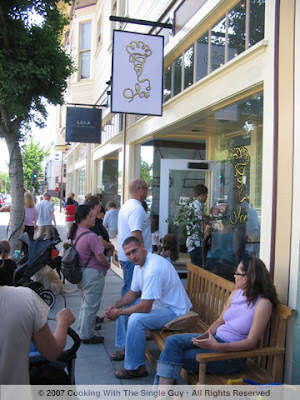 I recently went to get my haircut in the Elmwood neighborhood of Berkeley. And while there are a few restaurants in the area, I think one of main attractions these days is the 9-month-old Ici ice cream store. 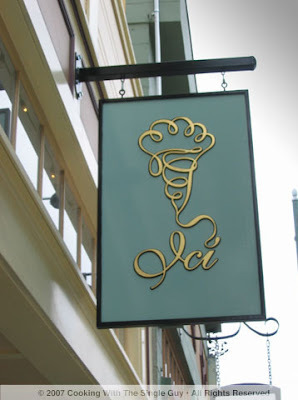 Ici, which means “here” in French, sells hand-made ice creams made with organic ingredients on the premises. (Thus the emphasis on “here.”) Co-owner Mary Canales (the former pastry chef at Chez Panisse) makes inspiring flavors that changes virtually day to day depending on what ingredients she gets her hands on. 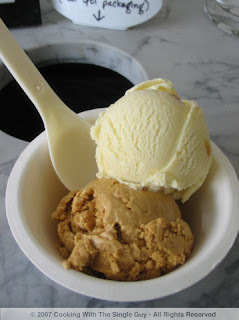 During my first visit after my hair appointment, I strolled in and ordered two scoops of the burnt caramel and cardamom and orange peel (pictured right). I sat at the bench inside the quaint shop (designed by business partner Erik Anderson) and enjoyed the creamy texture of the ice cream. The burnt caramel had a subtle flavor and reminded me of espresso ice cream, while the cardamom was bright, fresh and delicious! I have a bias toward citrus flavors, but I think this flavor would brighten anyone’s day. 3:45 p.m.—Here I am at the end of the line outside the Ici store. They have this nice bench outside for people to enjoy the ice cream (or wait for people in line). 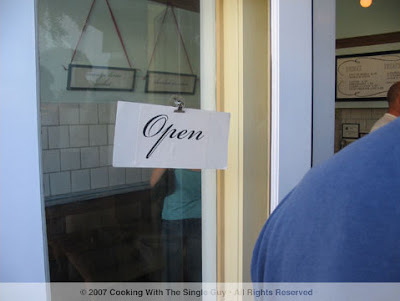 3:55 p.m.—I reach the “open” sign. This is when I begin to study what flavors I’m going to go with today. Canales does about 10 flavors a day, all seasonal, and they can really change daily. Last time I was there they had strawberry-rhubard ice cream and apricot sorbet, but this time those items were off the menu. (Also gone was my favorite cardamom and orange peel.) 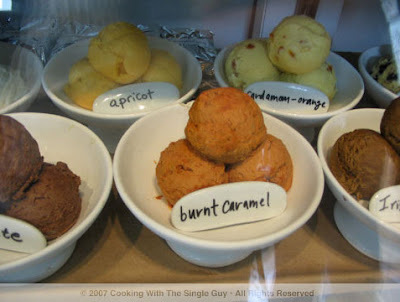 The flavors are primarily ice cream with a couple of sorbets (like mango during this visit). 3:58 p.m.—I step inside the tiny store. 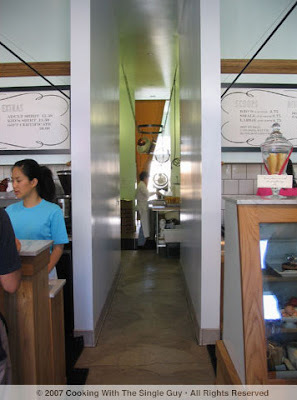 From the entrance you can look straight down the hallway to the kitchen and see people making ice cream. They always look pretty stress. I can see why with the lines. 4:02 p.m.—As I inch closer to the counter, I can still see through the window that the line continued to grow after me. 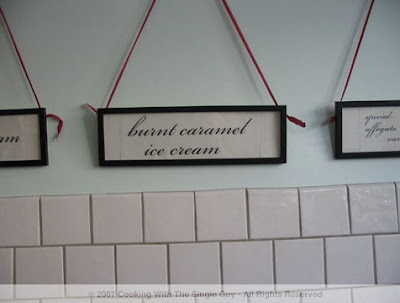 Part of Ici’s appeal is its quaint décor, including these signs showing the available flavors. Along with ice cream, I noticed a sign for “affogatto,” which is the Italian ice cream dessert where they pour espresso over vanilla ice cream. I was sooo tempted to order this since I had my first affogatto at Foreign Cinema and loved the combination! 4:04 p.m.—I reach the counter where today they had three people serving. Last time there was only one person. So they do plan for the peak hours. I order my typical two scoops, this time going with the new flavors “rose-pistachio” and “lemon-amareno cherry.” (I’d never heard of amareno but it’s apparently a sour cherry.) I typically order my ice cream in a cup because I don’t like to spill, but this time I wanted to try their cones, which cost an extra 50 cents. At the counter there were a whole bunch of other things to buy like cookies, cones and these orange peels. They’re all decorated in a very French flair. I like how all their supplies are composted. 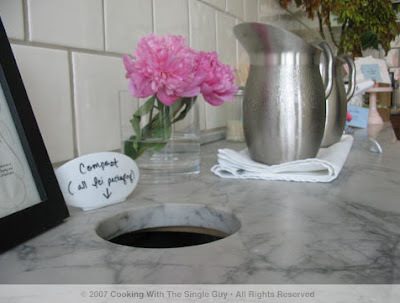 Here you can dump your spoon and cups. When I first walked into Ici last year soon after it first opened, I thought it was a bit pretentious. But now after having tried the flavors and quality, I feel lucky that I have access to such great ice cream on the East Bay. I won’t say it’s THE best ice cream around (I still prefer the texture of gelato), but I love the experimentation of flavors offered by Canales. Some are misses (I heard the Irish Stout flavor didn’t go off too well) but many of them are winners (I’m still dreaming of the lemon-amareno). Ici also sells bonbons and ice cream sandwiches that are pretty popular. I think next time I’m going back for the affogattto! 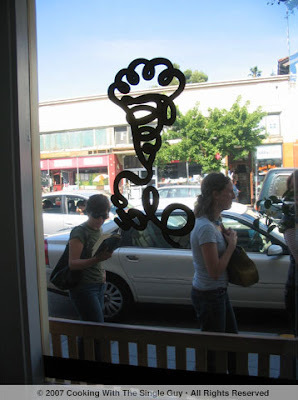 Ici, 2948 College Ave. (at Ashby), Berkeley. PH: 510.665.6054. Open daily from noon (except Monday when it opens later at 2 p.m.) until 9 p.m. (closing later at 9:30 p.m. on Friday and Saturday).